A Thuraya prepaid plan is the easiest way to subscribe to Thuraya satellite phone service: no credit checks and long-term contracts are required. BACKUP plan offers a longer validity period with lower annual cost. NEW! Significant changes to prepaid plan tariffs and rules happened in April 2019. 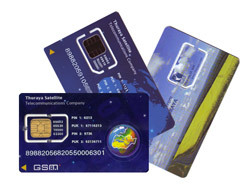 Purchase additional prepaid airtime to top up your active Thuraya prepaid account from ANY service provider. From Apr 1, 2019, all plans: A minimum $20 airtime top-up will be required every 365 days to maintain a positive account balance. - Initial amount of preloaded airtime decreased from $20 to $10. - The account renewal fee increased from $10 to $39, due annually (instead of biennially). - Mali is no longer a discounted rate origination area. Apr 1, 2019, PREPAY plan: In-network (Thuraya) rate call increased from $0.99 to $1.19 per minute. Jan 2012: ThurayaECO plan was discontinued. All ThurayaECO accounts were converted to the NOVA plan. May 2009: Thuraya CLASSIC plan was discontinued. All CLASSIC, SUPER and EASY accounts were converted to the PREPAY plan.